December is a time for beloved yuletide traditions: trimming the tree, hanging the stockings, drinking various nogs, and spending long, lingering hours watching reindeer via a live webcam setup. If that last part seems a little tricky to arrange, Animal Planet is here to help. At its Animal Planet Live website, the cable channel is beta testing a 24-hour-a-day video feed from the Como Park Zoo and Conservatory in Saint Paul, Minnesota, giving viewers the chance to peep on some genuine Rangifer tarandus any time of the day or night until Christmas. If it were somehow possible to cross-breed the movie Sliver with Rudolph The Red-Nosed Reindeer, the results would probably be nothing like this. Still, the chance to watch reindeer while sitting on a futon and eating pad thai is kind of cool, right? It’s all some kind of promotional stunt for Wild Winter Nights, a three-week programming block of seasonally appropriate shows beginning on December 14. At least there’s nonstop Christmas music playing in the background to keep things festive. Who doesn’t want to hear those songs continuously throughout December? 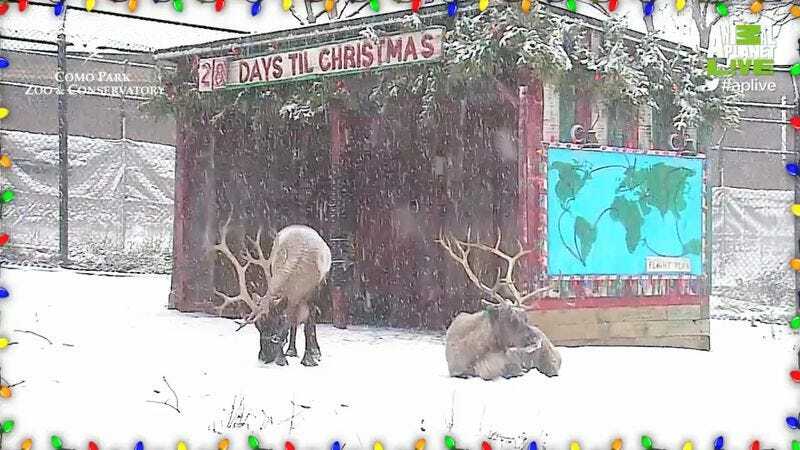 And those with absolutely no patience at all can simply check out the reindeer cam highlight reel.